Since my early teens I have owned a turntable and loved vinyl, 40 years has passed and in spite of all the digital razzmatazz I have kept faithful to vinyl replay. In the early 90s I "upgraded" to the classic Linn LP12 and Itok combination although I could never get on with the Linn cartridges of the time as the tracking was not good enough for me. I used an Audio Technica ATOC9 catridge and it all sounded very nice until I moved house. When setup in the new house the system seemed flat, lacking dynamics, this lead to several years of system changes and migrating from the Linn to a Garrard 401. I had the Garrard 401 fitted in a custom plinth with a Rega RB1000 and Dynavector Karat Ruby and thoroughly enjoyed the combination. The Ruby eventually died and was replaced with a Benz Micro Wood and since then I have not been satisfied with the vinyl replay, there is something wrong that I cannot understand. When the offer to review the Kubrick DCX came along I thought here is the chance to listen to a modern turntable and hopefully get to grips with my problem with the Benz. The Kubrick DCX came supplied with the Jelco SA750D arm and is also supplied with arm boards for the Rega and SME arms. The Rega mount is designed to take either the older style single point fixing or the more recent 3 point fixing. Soulines is a new manufacturer to me and are based in Serbia, they started out as TT Recycled supplying upgrades and tweaks for existing turntables as well as recycling turntables. 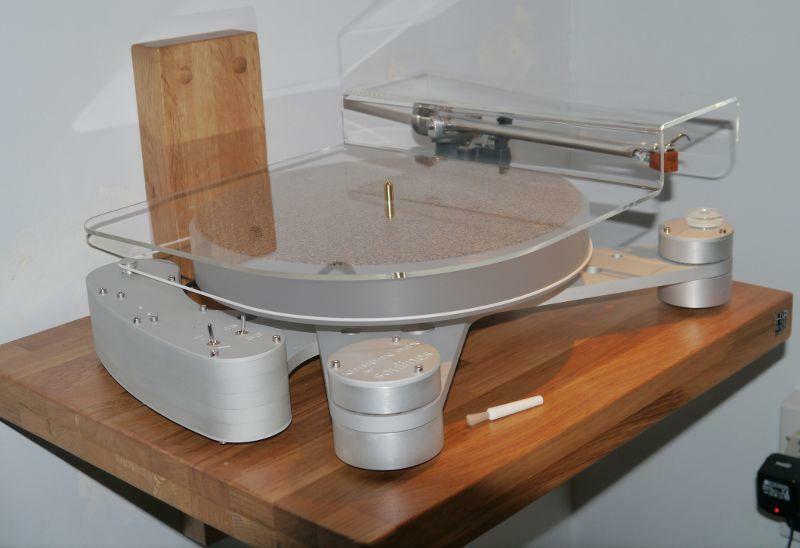 After much local success this led the team to design their own Hermes DCX turntable, then along came the Kubrick DCX. The Kubrick DCX uses the same acrylic platter and inverted main bearing as the Hermes with a rigid plinth built from differently shaped aluminium blocks that are strategically damped. The size and shape of the blocks are based on the "Golden Ratio" and "Fibonacci numbers" to gain uniform vibration damping and reduction in the moment of inertia in all three planes. 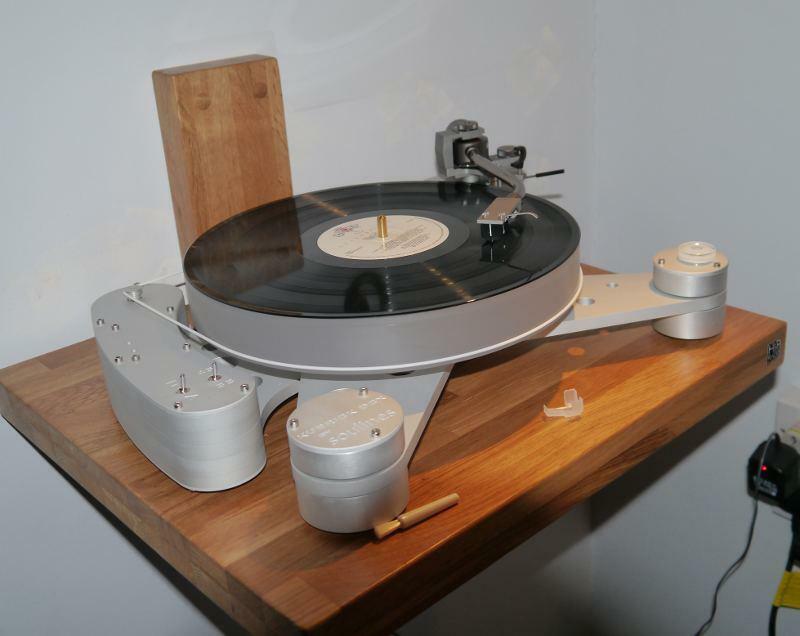 Whatever the marketing speak says I hope you will agree it is a very nice looking turntable? Igor at Soulines has been very helpful with prompt replies to my many emails, the Kubrick was dispatched quickly and arrived without delay in the UK. If only the UK revenue & customs (HMRC) had been so helpful and responsive. It took me over a week before I could extract the turntable, if you are thinking of purchasing a Kubrick in the EU just budget for the duties and don't argue with the customs authorities! When the Kubrick finally arrived it was well packed with clear unpacking and assembly instructions. It only took me a few minutes to unpack and get the turntable ready for installing a cartridge. The Kubrick came with the Jelco SA750D installed so with a removable headshell fitting the Denon DL103 was extremely simple. The Kubrick is powered from a simple power socket mounted power supply (wallwart), at this price point it would have been nice to see a custom power supply with appropriate IEC power cable for the country the turntable is destined for. As supplied the wallwart needed an adapter for the UK power sockets as it is an EU compatible design, I believe an appropriate power supply will be shipped in future. The wallwart supplies 12v DC to the speed control circuit that feeds the DC motor, this switchable for 33rpm and 45rpm with fine speed adjustment. The setup process is simple and with the Jelco arm's removable head shell fitting a cartridge like the Denon is very easy, this is aided by the excellent alignment protractor supplied. The protractor gives the user the options of Baerwald, Loefgren or Stevenson alignments and it really is simple to setup. With a cartridge like the Benz I suggest the user seeks the assistance of an experienced user, fitting an expensive cartridge with no stylus guard is a scary process whatever the turntable. I ran the Kubrick for a couple of weeks using the supplied Jelco arm and my trusty DL103 until curiosity took over and I fitted my Rega RB1000 with the Benz Micro Wood. 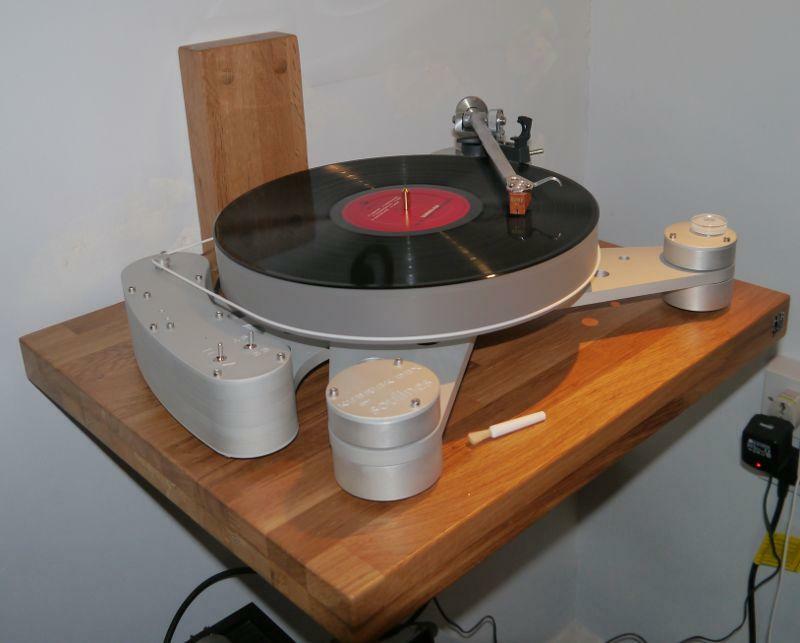 Fitting the Rega was extremely simple using the supplied arm board and dedicated height spacers. How does it sound (Rega arm & Benz cartridge)? Starting with my regular Rega/Benz combination fitted to the Kubrick it was obvious from the first track that the soft and sometimes over inflated bass I experienced in the Garrard 401 was now tamed. The bass was neutral and started/stopped with good precision, as has been said before the pace, rhythm and timing (PRAT) were excellent. I wish I had the technology and experience to measure the performance of the Kubrick as the speed accuracy and stability to my ears sounds very good. During my time with the Kubrick, Rega, Benz combination I listed to some of my Jazz collection, from Ella and Louis to Claire Martin with some Dave Brubeck and the Modern Jazz Quartet in the selection. What seemed common was the lack of coloration and realism of the music. As I write this review I am listening to The Milcho Leviev Quartet, Blues for the Fisherman album and even though the system is in the next room the double bass of Tony Dumas sounds so realistic as does the alto sax of Art Pepper, I could almost be at Ronnie Scotts in June 1980 as the recording was made. The focus so far has been on the bass and music timing but we should not forget the rest of the audio spectrum. The drums and piano on the Milcho Leviev album are portrayed with a similar lack of coloration without lacking in tonal character. The cymbals have the required level of metallic shimmer with the tune shining through on the piano, the rhythm is just addictive. Moving genres to my favorite female vocalist, Mary Black and the No Frontiers album, Mary's vocal are projected forward such that she could be standing in the middle and slightly in front of the speakers with Declan Sinnott on guitar set back and slightly to one side. Again the lack of coloration and timing shone through, on The Shadow the cello of Caroline Lavelle was so clear and the synthesiser of Sonal Lunny, I had never heard before. I had enjoyed the experience with the Kubrick, Rega & Benz combination so much it was hard to return to the Jelco arm with Denon cartridge but I knew from the initial setup this was still going to be a pleasurable experience. How does it sound (Jelco SA750D and Denon DL103)? Refitting the Jelco arm was simple and only took about 5mins, disconnect the cables from the phono stage, remove the three bolts and the Rega was removed. Reversing the process and the Jelco was fitted, this is the perfect turnable if you have multiple arms with different cartridges. First up was the Mary Black No Frontier album and from the first note the same lack of coloration and infectious rhythm shone through. The differences in the cartridge/arm combination were easy to hear, the superb bass of the Rega/Benz combination was replaced with a slightly less precise and lighter weight low end, whilst the vocals were warmer and less forward with the Jelco/Denon duo. The word out on the web says the Denon DL103 is the equal of any cartridge up to about Â£1000 and with the Kubrick/Jelco combination the Denon really does shine. With the Milcho Leviev on the platter the differences are small compared to the Rega/Benz combination, slightly less sparkle and the softer bass as heard on the Mary Black album. If you want to "improve" on the Denon there are numerous third party aluminium or wood bodies that are supposed to address some of the issues but personally I like it as supplied especially as it has a stylus cover to give peace of mind when not in use. Whatever arm you use with the Kubrick DCX the neutrality along with the superb timing is a major plus point. The Kubrick lets the arm and cartridge give their best performances adding little to the mix, just what a turntable should do in my opinion. The build quality is excellent, better than even a Linn of 20 years ago, with enthusiastic support from Igor at Soulines. As previously described the wall socket mounted power supply does let the turntable down a bit from a style and cosmetic point of view although in practice it worked perfectly so hide it away and forget about it. I have enjoyed my time with the Kubrick DCX enourmously, I have never heard vinyl sounding so good and will be sad when I have to pack it up and ship it back to Serbia. If you want a vintage vinyl sound with laid back, warm sound then perhaps this is not for you. If you just want to listen to the artists as intended then give this turntable a listen. The combination with the Jelco arm and Denon DL103 is hard to beat, the addition of the Rega arm and Benz cartridge costs significantly more and whilst better you do wonder if the additional cost is worth it. Perhaps just invest in a spare Denon DL103 then sit back and enjoy many years of wonderful music. The wall socket mounted power supply does let the turntable down a bit from a style and cosmetic point of view, and that at this price point it would have been nice to see a custom power supply with appropriate IEC power cable for the country the turntable is destined for. When we were prototyping the Kubrick DCX, we learned that PSU originally developed for the Kubrick DCX performs perfectly well, thus we decided that there is no point for further investment in separating the PSU into the custom box, because it will not affect the performance of the turntable itself, and probably it will only raise the final price of Kubrick DCX. In his review Mike came to similar conclusion (wall socket mounted power supply does let the turntable down a bit from a style and cosmetic point of view although in practice it worked perfectly), and actually gave a good advice, (hide it away and forget about it). When designing Kubrick DCX turntable my aim was to provide customers with maximum performance (music) for their investment, and if that could be provided utilizing simple wallwart, I would rather go for it, allowing customers to save some money for their music (vinyl, CDs, concerts, whatever). Probably, in the future we will develop some custom turntable PSU separated in fancy box with appropriate IEC power cable, although as a turntable designer, musician (trained cello, self-taught guitar/bass guitar) and mechanical engineer, I am not a big fun of complicated (sometimes expensive) solutions, and especially those governed by appearance, which I consider more as marketing than objective performance improvement.